After passing under the Queensway Drive Bridges we leave the Los Angeles River and enter San Pedro Bay. 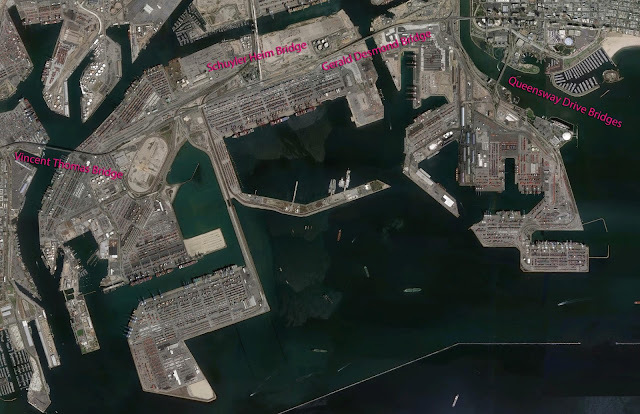 The Bay is dominated by Terminal Island and the Ports of Los Angeles and Long Beach. The Ports rely on three bridges to move goods in and out of Terminal Island. The Vincent Thomas Bridge is a suspension bridge designed by Jim Jurkovich at Caltrans in the 1950s. The Schuyler Heim Bridge is an old lift bridge that is currently being replaced with a cast-in-place box girder bridge. The Gerald Desmond Bridge is a truss arch bridge that is being replaced with a cable-stayed bridge. We'll spend the next few days studying these bridges. Los Angeles County, California Bridges: San Pedro Bay Bridges by Mark Yashinsky is licensed under a Creative Commons Attribution-NonCommercial-NoDerivatives 4.0 International License.